Bristol F.2B B1178 - Accident? Does anyone have the details or crash card for B1178, did it crash at Turnberry? 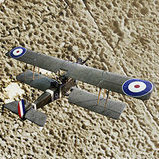 B1178 crashed at 1 School of Aerial Fighting and Gunnery, Turnberry on 28 May 1918 when the wings broke off in a dive. Lieut Reginald Milburn Makepeace and 2nd-Lieut Thomas Albert McClure were both killed. 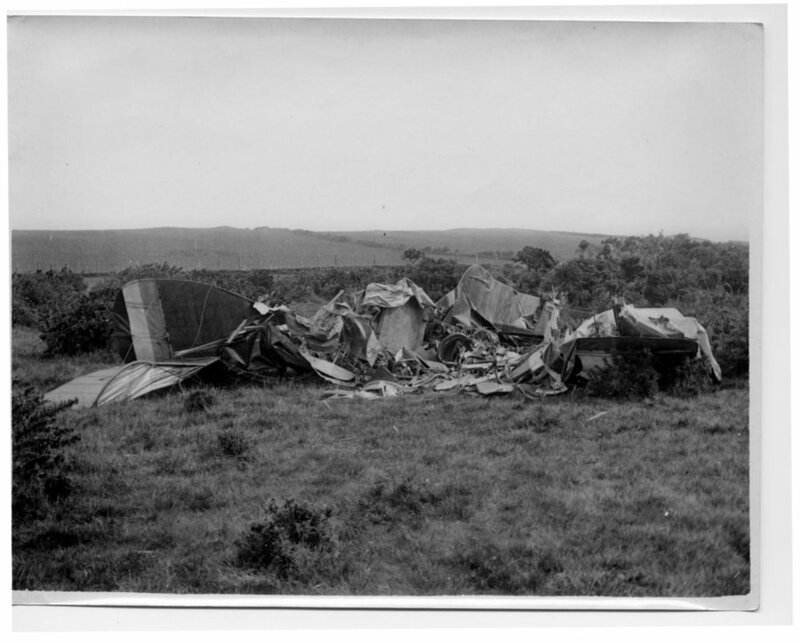 I have attached an image of the only Bristol F.2B crash I have at Turnberry, but not knowing enough about unit codes I'm not sure if this is B1178. Also, the bridge has been built over at Turnberry and the location for the crash of Makepeace and Milburn is 500yds west of the airfield, I would say that the bridge is more South or slightly South West. Someone has suggested to me that it could be Ayr? 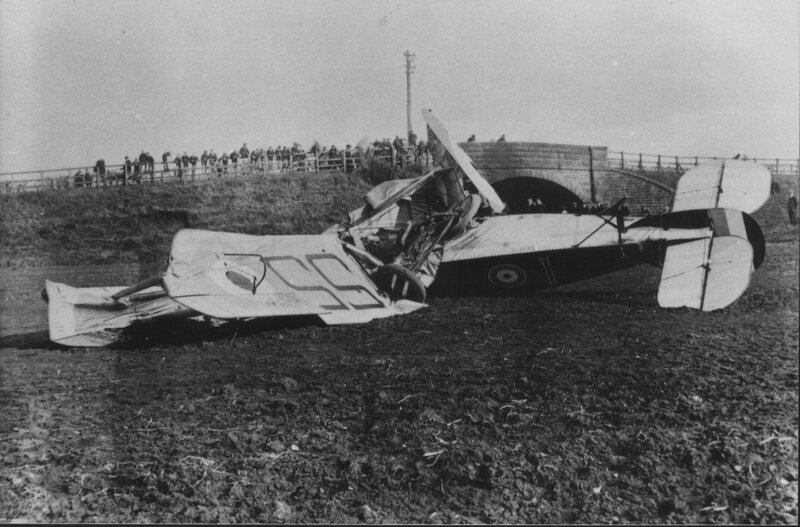 The only other F2B to crash at Turnberry was C4841 from the 2 (Aux) School of Aerial Gunnery, and this took place after the engine failed on the 13th February 1918 and the pilot made an error of judgement, turned into the wind and stalled the aircraft which nose-dived into the ground, injuring both pilot and passenger. Since the numeral on the side of the fuselage in the photograph above is a '1' and not a '2', this would indicate that the aircraft is indeed B1178, which crashed after the wings folded back due to excessive strain placed on the airframe after the pilot opened the engine up too quickly in a dive. The Court of Enquiry determined that the failure was either a main spar or a drift wire on the right hand planes. The photo doesn't show B1178. The attached photo shows this crash and the black serial is visible on the fin. There were only 5 BF incidents recorded on the RAFM Casualty Cards fot the units at Turnberry and Ayr. The photo of the machine marked with the station number 55 and flight number 1 would therefore have probably been C4841 if the photo was taken at Turnberry. Of the incidents at Ayr, B1180 was photographed with the flight number 3 and C4689 caught fire, which leaves C4688. B1178 (Falcon I, first flown 25.11.1917) 1 SAFG Turnberry/Ayr by 4.4.1918 (Capt J.H. Letts) and wrecked 28.5.1918 (Lt R.M. Makepeace/2Lt T.A. McClure both KIFA, RH wings folded in flight – engine 1/F/581/WD12561). B1180 (Falcon I) 1 SAF Ayr by 2.1918, marked as a/c 3 and wrecked 26.4.1918 (Sgt A. Woodfield IIFA, stalled to avoid collision with trees – engine 1/F/4189/WD10503). C4688 (Falcon III) 1 SAF Ayr, given as C7688, and wrecked 2.4.1918 (2Lt J.E. Doe/Cpl H.R. Young USAS both IIFA, failed to exit a spin – engine 3/F/723/WD32611). C4689 (Falcon II) 1 SAFG Ayr by 18.4.1918 and wrecked 23.4.1918 (Lt L.W. Wheelock/Lt N. Berry USAS both IIFA, flat turn after take-off, dived in and caught fire on impact – engine 2/F/111/WD22397). C4841 (Falcon I) 2 (Aux) SAG Turnberry and wrecked 13.2.1918 (2Lt F.G. Sutton/AM1 W.G. Hoyes both IIFA, stalled on low turn and spun in – engine 1/F/389/WD10495).